1967-68 North Carolina Inspection Sticker - $20.00 : Bob Hoyts Classic Inspection Stickers, Add a Final Touch to your Restoration! 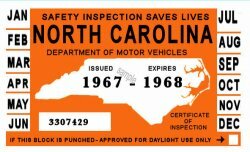 This 1967-68 North Carolina Inspection sticker has been carefully reproduced directly from an original, both front and back. "It has a peel and stick" adhesive sheet on the front that you peel back and then apply the sticker to the inside of your windshield just like the original. For an additional $10.00 you can order this sticker with your license plate number placed on the front of the sticker in place of the old serial number.